The holiday season is the perfect time to indulge in well-loved Filipino foods as most households cook-up sumptuous meals using treasured family recipes. And with all the dishes spread around the holiday table during parties and Noche Buena, it’s quite easy for anyone to quickly gain weight, especially if they don’t watch the plates of white rice they are eating. To help Filipinos eat healthy and stay in shape even throughout the yuletide celebrations, Robinsons Supermarket has launched an exclusive promo that promotes the consumption of brown rice in an affordable and simple way. In partnership with the Philippine Rice Research Institute, the Brown Rice promo offers shoppers a P5 discount for every kilo of participating brown rice products they buy at selected Robinsons Supermarket and Robinsons Selections outlets. Diners at the supermarket’s ready-to-eat section can also readily switch to brown rice by paying only an additional P2. The promo runs until December 17 only. 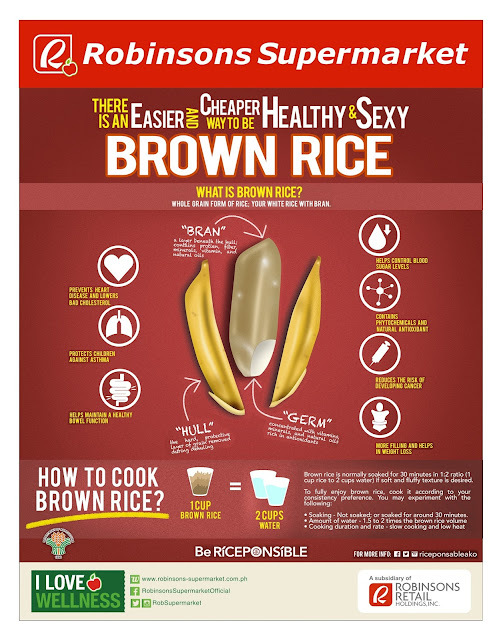 With its nutrient rich bran, brown rice is the better alternative to white rice as it is proven to prevent heart disease and lower bad cholesterol, protect children against asthma, help maintain a healthy bowel function, help control blood sugar levels, and reduce the risk of developing cancer, among other health benefits. 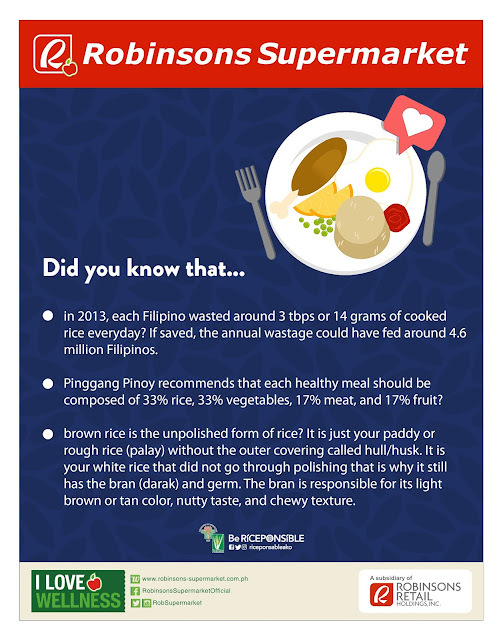 So start another healthy habit in time for the holiday celebrations by eating brown rice. Head over to Robinsons Supermarket to get your brown rice at discounted prices. Check out www.facebook.com/RobinsonsSupermarketOfficial or visit www.robinsons-supermarket.com.ph for more details.